Police say that more than half of the victims in the latest disaster were children. 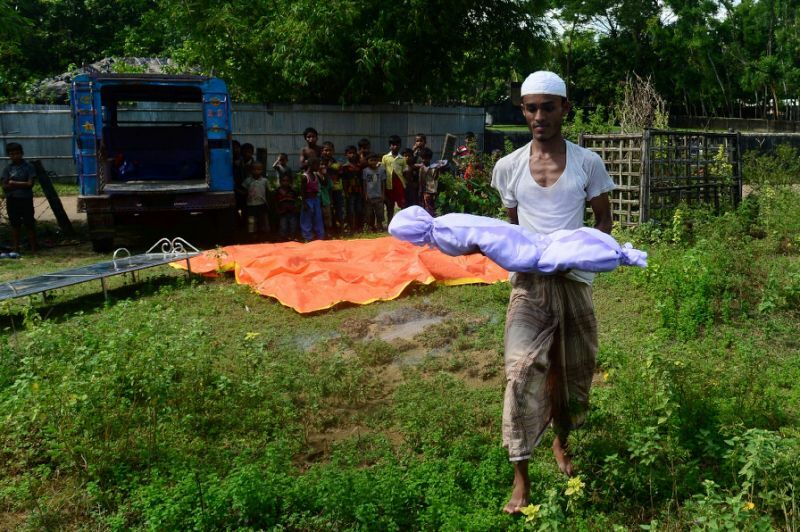 The bodies of another nine refugees have washed up in Bangladesh after an overloaded boat carrying scores of desperate Rohingya sank in rough seas, police said Tuesday, taking the confirmed death toll to 23. Eight bodies were found on the banks of the Naf river, which separates Bangladesh from Myanmar, and another was found miles away on the island of St Martin. More than half of the victims in the latest disaster were children, said Mian Uddin, police chief for the border town of Teknaf. He could not say how many people were missing, but survivors and officials have said the boat was carrying between 60 and 100 people. So far 15 have been rescued by Bangladesh coast guards and border guards, though authorities say some may have swum to Myanmar. More than half a million refugees have arrived in Bangladesh since August 25, fleeing a military crackdown that followed attacks by Rohingya militants on police posts. The exodus had slowed, but in recent days government officials say there have been thousands of fresh arrivals, most coming from parts of Myanmar's Rakhine state that are far from the border with Bangladesh. Many cross the Naf river at its narrowest point, but others are attempting to make the journey by sea, boarding often rickety fishing trawlers that are wholly inadequate for the rough waters in the Bay of Bengal. Nearly 160 have drowned. Among the latest influx were two young boys aged two and three, who died due to hunger and exhaustion as they entered Bangladesh.